An engine-generator or portable generator is the combination of an electrical generator and an engine (prime mover) mounted together to form a single piece of equipment. This combination is also called an engine-generator set or a gen-set. In many contexts, the engine is taken for granted and the combined unit is simply called a generator. Engine-generators are available in a wide range of power ratings. These include small, hand-portable units that can supply several hundred watts of power, hand-cart mounted units, as pictured below, that can supply several thousand watts and stationary or trailer-mounted units that can supply over a million watts. Regardless of the size, generators may run on gasoline, diesel, natural gas, propane, bio-diesel, water, sewage gas or hydrogen. Most of the smaller units are built to use gasoline (petrol) as a fuel, and the larger ones have various fuel types, including diesel, natural gas and propane (liquid or gas). Some engines may also operate on diesel and gas simultaneously (bi-fuel operation). Many engine-generators use a reciprocating engine, with fuels mentioned above. This can be a steam engine, such as most coal-powered fossil-fuel power plants use. Some engine-generators use a turbine as the engine, such as the industrial gas turbines used in peaking power plants and the microturbines used in some hybrid electric buses. The generator voltage (volts), frequency (Hz) and power (watts) ratings are selected to suit the load that will be connected. Engine-driven generators fueled on natural gas fuel often form the heart of small-scale (less than 1,000 kW) combined heat and power installations. There are only a few portable three-phase generator models available in the US. Most of the portable units available are single-phase generators and most of the three-phase generators manufactured are large industrial type generators. In other countries where three-phase power is more common in households, portable generators are available from a few kW and upwards. Portable engine-generators may require an external power conditioner to safely operate some types of electronic equipment. Small portable generators may use an inverter. Inverter models can run at slower RPMs to generate the power that is necessary, thus reducing the noise of the engine and making it more fuel-efficient. Inverter generators are best to power sensitive electronic devices such as computers and lights that use a ballast. The mid-size stationary engine-generator pictured here is a 100 kVA set which produces 415 V at around 110 A. It is powered by a 6.7-liter turbocharged Perkins Phaser 1000 Series engine, and consumes approximately 27 liters of fuel an hour, on a 400-liter tank. Diesel engines in the UK can run on red diesel and rotate at 1,500 or 3,000 rpm. This produces power at 50 Hz, which is the frequency used in Europe. In areas where the frequency is 60 Hz (United States), generators rotate at 1,800 rpm or another divisor of 3600. Diesel engine-generator sets operated at their peak efficiency point can produce between 3 and 4 kilowatt hours of electrical energy for each liter of diesel fuel consumed, with lower efficiency at partial loads. Many generators produce enough kilowatts to power anything from a business to a full-sized hospital. These units are particularly useful in providing backup power solutions for companies which have serious economic costs associated with a shutdown caused by an unplanned power outage. For example, a hospital is in constant need of electricity, because several life-preserving medical devices run on electricity, like ventilators. A very common use is a railway diesel electric locomotive, some units having over 4,000 hp. Large generators are also used onboard ships that utilize a diesel-electric powertrain. Voltages and frequencies may vary in different installations. Engine-generators are used to provide electrical power in areas where utility (central station) electricity is unavailable, or where electricity is only needed temporarily. 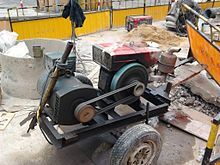 Small generators are sometimes used to provide electricity to power tools at construction sites. Trailer-mounted generators supply temporary installations of lighting, sound amplification systems, amusement rides etc. You can use a wattage chart to calculate the estimated power usage for different types of equipment to determine how many watts are necessary in a portable generator. Trailer-mounted generators or mobile generators, diesel generators are also used for emergencies or backup where either a redundant system is required or no generator is on site. 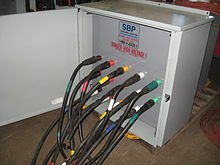 To make the hookup faster and safer, a tie-in panel is frequently installed near the building switchgear that contains connectors such as camlocks. The tie-in panel may also contain a phase rotation indicator (for 3-phase systems) and a circuit breaker. Camlock connectors are rated for 400 amps up to 480-volt systems and used with 4/0 type W cable connecting to the generator. Tie-in panel designs are common between 200- and 3000-amp applications. Standby electrical generators are permanently installed and used to immediately provide electricity to critical loads during temporary interruptions of the utility power supply. Hospitals, communications service installations, data processing centers, sewage pumping stations and many other important facilities are equipped with standby power generators. Some standby power generators can automatically detect the loss of grid power, start the motor, run using fuel from a natural gas line, detect when grid power is restored, and then turn itself off—with no human interaction. Privately owned generators are especially popular in areas where grid power is undependable or unavailable. Trailer-mounted generators can be towed to disaster areas where grid power has been temporarily disrupted. 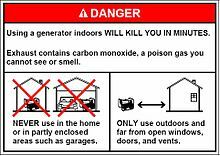 Some generators include a warning stating "Using a generator indoors will kill you in minutes"
Every year, incorrectly used portable generators result in deaths from carbon monoxide poisoning. A 5.5 kW portable generator will generate the same amount of carbon monoxide as six cars, which can quickly build up to fatal levels if the generator has been placed indoors. Using portable generators in garages, or near open windows or air conditioning vents can also result in carbon monoxide poisoning. Additionally, it is important to prevent backfeeding when using a portable engine generator, which can harm utility workers or people in other buildings. Before turning on a diesel- or gasoline-powered generator, users should make sure that the main breaker is in the "off" position, to ensure that the electric current does not reverse. Exhausting extremely hot flue gases from gen-sets can be done by factory-built positive pressure chimneys (certified to UL 103 test standard) or general utility schedule 40 black iron pipe. It is recommended to use insulation to reduce pipe skin temperature and reduce excessive heat gain into the mechanical room. There are also excessive pressure relief valves available to relieve the pressure from potential backfires and to maintain the integrity of the exhaust pipe. ^ Denis, Linda (1 January 2014). "Portable Generator Specifications and Reviews". Portable Generators Rated. Retrieved 23 August 2016. ^ "Ultimate Flexibility for Emergency Power Loss". ^ "What size generator do I need?". bestportablegenerators.org. ^ "CPSC Approves NPR Proposing New Warning Label for Portable Generators". ^ a b "Electrical Safety and Generators". Centers for Disease Control and Prevention. Retrieved 3 April 2014. ^ Hampson NB, Stock AL (2006). "Storm-related carbon monoxide poisoning: lessons learned from recent epidemics". Undersea & Hyperbaric Medicine. 33 (4): 257–63. PMID 17004412. Retrieved 2010-11-14. ^ "Carbon Monoxide Poisoning from Hurricane-Associated Use of Portable Generators --- Florida, 2004". ^ Waite, Thomas; Murray, Virginia; Baker, David (3 July 2014). "Carbon Monoxide Poisoning and Flooding: Changes in Risk Before, During and After Flooding Require Appropriate Public Health Interventions". PLoS Curr. 6. doi:10.1371/currents.dis.2b2eb9e15f9b982784938803584487f1. PMC 4096798. PMID 25045587. ^ Damon SA, Poehlman JA, Rupert DJ, Williams PN (2013). "Storm-Related Carbon Monoxide Poisoning: An Investigation of Target Audience Knowledge and Risk Behaviors". Soc Mar Q. 19: 188–199. doi:10.1177/1524500413493426. PMC 4559492. PMID 26345640. ^ "Engine Generator Uses and Safety". W. Danley Electrical Contracting. Retrieved 20 February 2015. 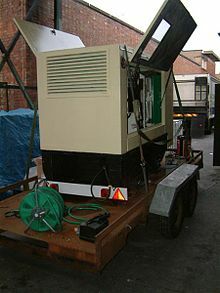 Wikimedia Commons has media related to engine-generators.